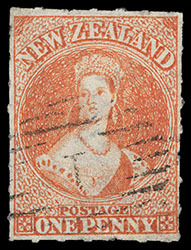 New Zealand, 1862, Queen Victoria "Chalon Head", 1d bright orange vermilion, rouletted 7, Large Star watermark, exceptionally well centered with rouletting all around, strong radiant color on bright paper, neat numeral "1" barred oval of Auckland, Extremely Fine and choice; with 1953 R.P.S.L. certificate. Scott No. 11c var. Campbell Paterson No. A1e (Y) var. SG No. 47 var. £850 as normal ($1,120). 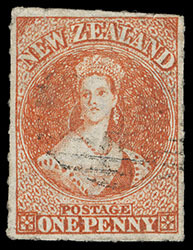 New Zealand, 1862, Queen Victoria "Chalon Head", 1d orange vermilion, rouletted 7, Large Star watermark, lightly cancelled by barred oval, well centered with rouletting all around, strong color and impression on bright paper, tiny separation tear at top, Extremely Fine appearance. Scott No. 11c var. Campbell Paterson No. A1e (Y). SG No. 47 £850 ($1,120). 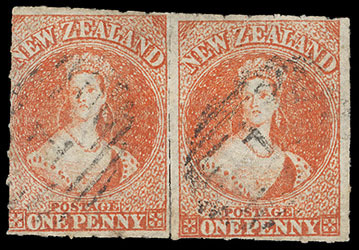 New Zealand, 1862, Queen Victoria "Chalon Head", 1d orange vermilion, rouletted 7, Large Star watermark, horizontal pair, showing rouletting all around, bright radiant color, each cancelled by numeral "1" barred oval of Auckland, some separation between, Fine and rare multiple. Scott No. 11c var. Campbell Paterson No. A1e (Y). SG No. 47 £1,700 as singles ($2,230). 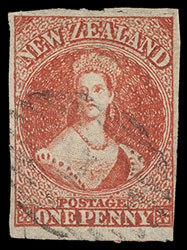 New Zealand, 1862, Queen Victoria "Chalon Head", 1d vermilion, rouletted 7, Large Star watermark, rouletting on three sides, left within design and right scissor separated as a result, beautiful deep vibrant color, cancelled by numeral "1" barred oval of Auckland, small scissor cut at bottom left, Very Fine and attractive example of this scarce stamp. Scott No. 11c. Campbell Paterson No. A1e (X). SG No. 48 £800 ($1,050). 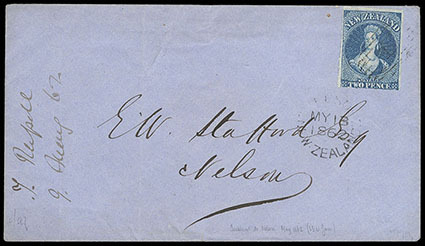 New Zealand, 1862, Queen Victoria "Chalon Head", 2d deep blue, rouletted 7, Large Star watermark, roulettes mostly showing on all sides, bright color and paper, light numeral "1" barred oval of Auckland, Fine and scarce; with 1983 R.P.S.L. certificate. Scott No. 12c. Campbell Paterson No. A2d (Y). SG No. 49 £475 ($620). 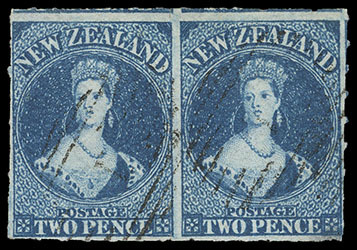 New Zealand, 1862, Queen Victoria "Chalon Head", 2d bright blue, rouletted 7, Large Star watermark, horizontal pair, deep rich color, unusually well centered with roulettes showing on all sides, each cancelled by light barred oval, lower right corner thin, otherwise Very Fine and scarce multiple. Scott No. 12c var. Campbell Paterson No. A2d (Y) var. SG No. 49 var. £950 ($1,250). New Zealand, 1862, Queen Victoria "Chalon Head", 2d deep blue, rouletted 7, Large Star watermark, showing roulettes nearly all around, light strike of numeral "1" barred oval, matching "Auckland, New-Zealand, 9 MY 9, 1862" rimless origin backstamp on blue cover to Nelson, May 13th arrival cds, 1862 docketing at left; light cover fold at left well clear of the adhesive, Very Fine and choice, Joseph Hackmey, Spink Shreves, February 2009, lot 1222; with 1989 B.P.A. certificate. Scott No. 12c. Campbell Paterson No. A2d (Y). SG No. 49 Estimate $4,000 - 6,000. 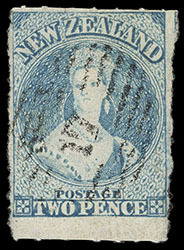 AN EXCEPTIONAL AND RARE USE OF THE 1862 2D DEEP BLUE ROULETTED 7, THIS BEING THE EARLIEST RECORDED USE OF THE AUCKLAND ROULETTE 7 ISSUE. 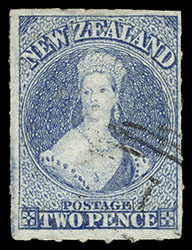 New Zealand, 1862, Queen Victoria "Chalon Head", 2d ultramarine, rouletted 7, Large Star watermark, nicely centered with roulettes all around, beautiful bright color in this distinctive shade variety, lightly cancelled by numeral "1" barred oval of Auckland, Very Fine and choice; with 1934 R.P.S.L. certificate as slate blue. Scott No. 12c var. Campbell Paterson No. A2d (O) var. SG No. 50 var. £850 as slate ($1,120). 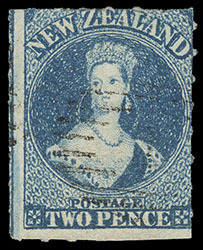 AN EXCEPTIONALLY RARE EXAMPLE OF THE 1862 2D ULTRAMARINE ROULETTED 7 AT AUCKLAND, UNLISTED BY STANLEY GIBBONS AND CAMPBELL-PATERSON. Joseph Hackmey, Spink Shreves, May 2010, lot 2221; with 1953 R.P.S.L. & 1987 Holcombe certificates. Scott No. 12c var. Yvert No. 6212. Campbell Paterson No. A2d (O). SG No. 50 Estimate $4,000 - 6,000. 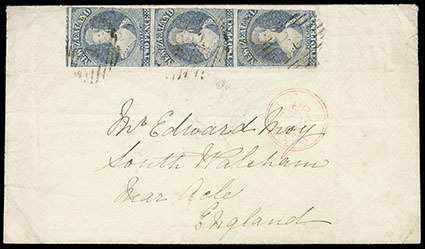 AN EXCEPTIONALLY RARE 1862 2D PALE BLUE ROULETTED 7 VERTICAL STRIP OF THREE USED ON COVER. References: Illustrated in Odenweller as part of fig. 5.26, p. 88. New Zealand, 1862, Queen Victoria "Chalon Head", 2d pale blue, rouletted 7, Large Star watermark, position R. 20/8, rouletting at top and bottom, sides roughly separated but clear, well centered, bright color and paper, cancelled by numeral "17" barred oval of Christchurch, Very Fine and scarce; with 2012 R.P.S.N.Z. certificate. Scott No. 12c var. Campbell Paterson No. A2d (N). SG No. 51 £600 ($790).